Let’s warm up this blog with the short story of a travel I just finished. Last July, two friends of mine and I took a caravan along the Portuguese coast. One of them, Giampaolo, moved to Lisbon a few months ago, while the other, Massimiliano, has been living in Prague since almost ten years. Our idea was simple: to sleep every night in a different place and to see as many beaches as possible. Guided by Giampaolo’s questionable organization skills, we were set up for both success and failure at the same time. The day begun with heavy desperation on our side, as we got denied at the car rental desk of the Lisbon airport. My friend Massimiliano, who reserved the car with his credit card, had his driving license expired a few years ago. My other friend Giampaolo and I had both valid driving licenses but no credit card to offer as a guarantee of the rental contract. Even trying our best of negotiation skills didn’t work out. It was just not possible for us to get a car. While the amount of curses was rising by the minute, Giampaolo managed somehow to secure a caravan at Indie Campers through a friend of his. From zero to hero: we took the van and started the journey towards Nazaré, where we had dinner with friends of Giampaolo’s and slept close to the beach. Sadly, the weather was pretty bad and we couldn’t see the sea too much. Giampaolo and I took a brief bath in the ocean, though the water was cold and the wind was strong. Should have we avoided it? Maybe yes, but we couldn’t resist the idea. 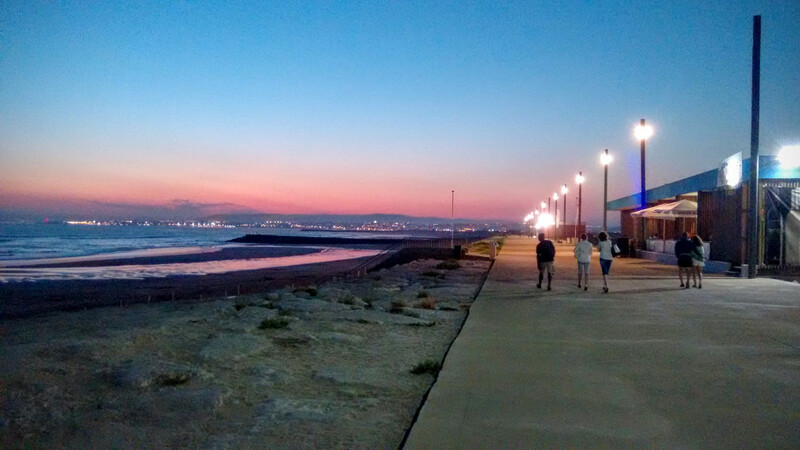 After a night of good thoughts and good wine, we headed to Costa de Caparica, just south of Lisbon. Giampaolo had booked a surf lesson for us in advance on the next morning, so we decided to spend the night there. The day went by with some sight-seeing and listening to Giampaolo’s promises of how beautiful the surf lesson was going to be. Every promise from him was met with a rising amount of scepticism on my side. I had known the guy for too long, to still believe to everything he was saying. The “25th of April” bridge was impressive and crossing it quite a good experience. The highlight of the day, however, was Giampaolo trying to understand how a self-service fuel pump worked by asking some surprised Portuguese men. After some light dinner (for a change), we put our tents close to the beach, ready for the next day. Before this day, the only thing I had surfed was the internet. The ocean waves are something completely different and this didn’t come as a surprise to me. Still, the amount of physical effort involved even in just one hour and a half of surfing was unexpected. We had tons of fun, though, trying to stand up on the table one wave after the other and miserably failing at it. It was more a matter of confidence and balance, rather than raw strength. Too bad I was not equipped with any of them. After that we had lunch at a restaurant on the beach, before heading to Portinho de Arrábida, in the middle of a natural park. 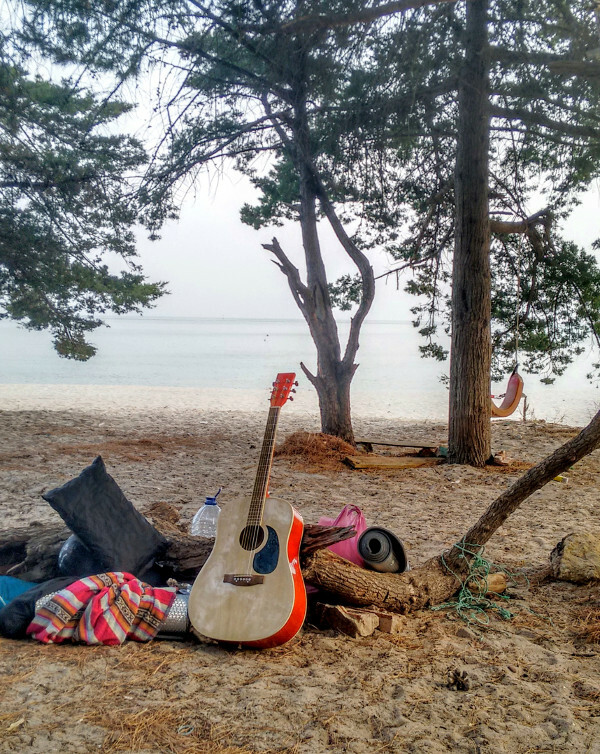 We arrived just before sunset, and we decided to put our tents on the beach in a quiet spot. The only visitors we had were two wild pigs who were looting the trash cans there. The place was very beautiful, and we had a long talk under the full moon, enjoying some wine before the wind became too cold. We woke up many times during the night because of it, though sometimes my friends were snoring louder than the wind. I didn’t know whether to laugh or to cry. God bless my earplugs. Leaving Portinho de Arrábida wasn’t easy. The place was even more charming under full daylight but the desire to discover new places was still strong in us. We lunched in Setúbal with some typical choco frito (fried squid) and cod. Everything was very delicious and it made me think about all the dull meat meals I had since I moved to Germany. My favourite place of the day was Costa de Santo André. On one side of the beach you have a very calm lagoon, whereas on the other side you have the full strength of the ocean battling a steep foreshore. For the first time I was facing waves that were taller than me and it was a lot of fun. After driving out the trauma with some beer and caracóis (snails), we arrived in Porto Covo to spend the night. The small town was being prepared to host the first part of a big music festival. Though Massimiliano didn’t like our camping spot too much, it was too late to go somewhere else. Apparently, on the next day we would learn how even the local police didn’t like our spot choice. But that evening we couldn’t know: it was only us, the sea, and the wine. Giampaolo had to polish off his diplomatic skills with the police in the morning, as we camped in a place where we were not allowed to. After avoiding a unhealthy fine from those gentlemen, we headed to the southernmost region of Algarve and more precisely to Sagres. Sagres is located at the “tip” of Portugal, dividing the long west coast from the shorter, but more touristic, south coast. A small castle is there to make this landmark even more important. Algarve. A small panoramic view. Before that, we managed to take a bath in a couple of very charming beaches. The amount of happiness and self-satisfaction increased dramatically after dinner. We had a lot of fish and seafood and wine to wash it down, courtesy of Massimiliano, who valiantly offered to pay for all of it. We decided to spend the night close to Praia da Igrina, just a few kilometres from Sagres. The night was cold and the wind came back to visit us, but the wine helped us fall asleep without too much trouble. The mood started to become somehow more melancholic than the days before: as a matter of fact, our journey was coming to an end. Day 6 was going to be the last day on the road, before going back to Lisbon. We decided (actually it was mainly Giampaolo’s decision) to go back to Porto Covo for the first day of the music festival. The battery situation was critical, with only a couple of devices that had some left. During the day, we had our usual run of several beaches to take a bath and curses directed at Giampaolo. Eventually, Massimiliano and I were a bit too tired and uninterested in the festival to stay there the whole night. This time, at least, we chose a place where we were allowed to camp. After taking one last bath in Porto Covo, we had to return our beloved caravan to Indie Campers and go back to Lisbon. Massimiliano had his flight on the next day but at least we managed to celebrate all together at a house party. Eventually, all travels come to an end. Before that happens, though, there’s always a plan for a new one in your head. 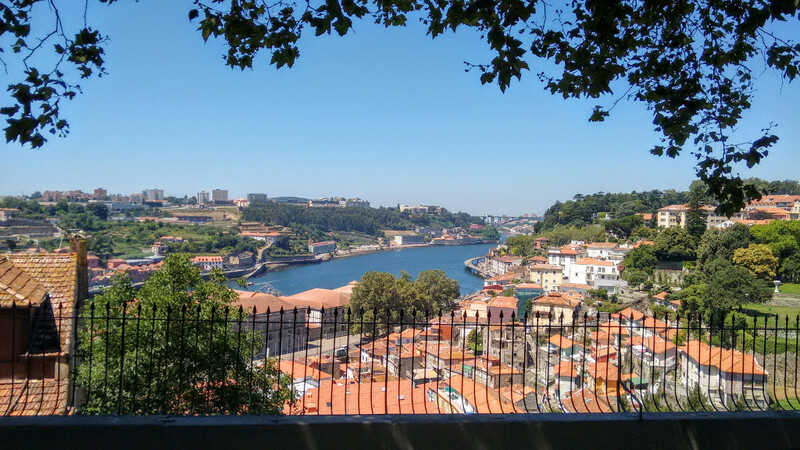 I spent a couple of days in Porto visiting my friend Mariana, whom I hadn’t seen in more than three years, and in Lisbon together with Giampaolo. This journey was short but also very beautiful. I was sad to leave Portugal even though I was also happy to be back in Berlin and go on with my “normal” life. In the next weeks, being away from work will allow me to take the necessary time to enjoy the summer in Berlin and, at the same time, prepare my next travel.